Chikkaness Avenue: JAYA is back on the concert stage with "No Boundaries"
JAYA is back on the concert stage with "No Boundaries"
"THE QUEEN : BACK ON THE CONCERT SCENE" Three years after her last concert, Jaya the county's one and only Queen of Soul will once again take the stage at the Music Museum for her "No Boundaries”concert on Friday May 12, 2017. The title of the concert came from the discussion between Cornerstone's Jeff Vadillo and Jaya herself when she mentioned that she doesn’t want to be bound or tagged by just one music genre and that she wants to perform more genres given to her from classical to musicals. The concert producers Vinz Abasolo and David Bhowie Cabawatan of Aqueous Entertainment agreed and used this title for her comeback concert. When asked what fans can expect from her concert, she said that the fans would surely be refreshed by her recollection of early smash hits like “Dahil Tanging Ikaw”, “Laging Naroon Ka”, “Wala Na Bang Pag-ibig” and the rest of her iconic songs. The Queen of Soul also mentioned that the fans should expect stunning performances with the Queen of R&B Kyla, Master of Soul Thor and Soul Supreme KZ Tandingan. Something that she's been dying to do since the three are close to her heart because of obviously being one in genre and all are her friends and siblings in her management circle Cornerstone Entertainment. With special participation by one of the music scene's freshest voices - Kara. After her debut in 1995 and winning her first Metropop Song Festival title with the song “Sometimes You Just Know”, Jaya was noted as OPM’s female record holder of a nine-times platinum album and the rest is history. She is currently part of the regular jury on It's Showtime's Tawag ng Tanghalan, now on it's second season for kids. When asked if the young Jaya will join TNT what would her competition be and what would she tell her young self as a TNT jury she said, "Maybe a song by Angela Bofill or ‘Break It To Me Gently’ and I would tell the young Jaya to practice a lot and listen to advices from different singer and open your ears and mind to criticisms but you’ll learn from them. Also not to listen to bashers.” Jaya's very first album under her new record label Star Music is already in the works, having a single entitled "Kasalanan" composed by the Pop Rock Superstar Yeng Constantino as a debut single. 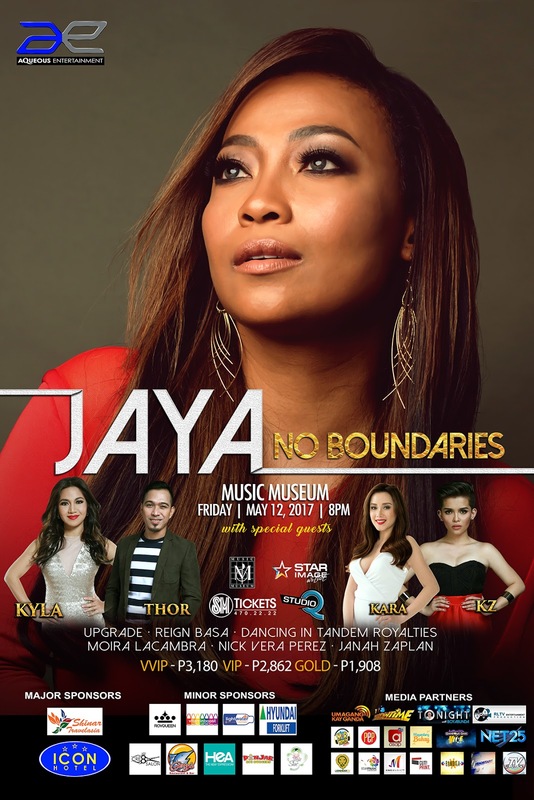 "JAYA : No Boundaries" will be held at the Music Museum on May 12, 2017 at 8 pm. Produced by Aqueous Entertainment and co-presented by Star Image and Studio Q. Line produced by Cornerstone Entertainment. The much awaited musical treat will also feature Upgrade, Dancing in Tandem Royalties, Moira Lacambra, Jannah Zaplan, Nick Vera Perez and Reign Basa as front acts. Tickets are still available at all SM ticket outlets nationwide or call ‎470-2222, and Music Museum Ticket Booth or call them at 721-0635 / 721-6726 for more information. Also supported by MYX, Manila Concerts, abscbn.com, OnemusicPH and inquirer.net.